Mandy Xu shops with a digital app. Grocery shopping has not changed much over the past 100 years. Since Piggly Wiggly introduced the concept of picking out your own groceries in the 1930s, few technological advancements have stood out. The first shopping cart came along in 1937, and self-checkout was introduced more than 50 years later, in 1992. But Amazon’s recent acquisition of Whole Foods Market was an abrupt wake-up call, setting off a scramble for supermarkets to adopt new technology to compete for customers who’ve become accustomed to getting exactly what they want, delivered quickly to their doorsteps. The desire for change in the grocery shopping experience was made apparent last month, when the public got its first glimpse of the Amazon Go store in Seattle. Consider the irony: Designed to eliminate the checkout line, the store has had a line outside its entrance since it opened. And just last week, Amazon announced that it would begin offering groceries from Whole Foods through its two-hour Prime Now delivery service. In 2016, about 23 percent of consumers made food and beverage purchases online, according to research from Nielsen and the Food Marketing Institute, but that’s poised to rise to 70 percent in as little as five years, Rains said. Online food and beverage purchases in the United States could reach $100 billion by 2022, according to a report Rains coauthored, yet most traditional grocery stores don’t have the talent, experience, or technology to truly compete both online and in stores. In short, the grocery store has to evolve. 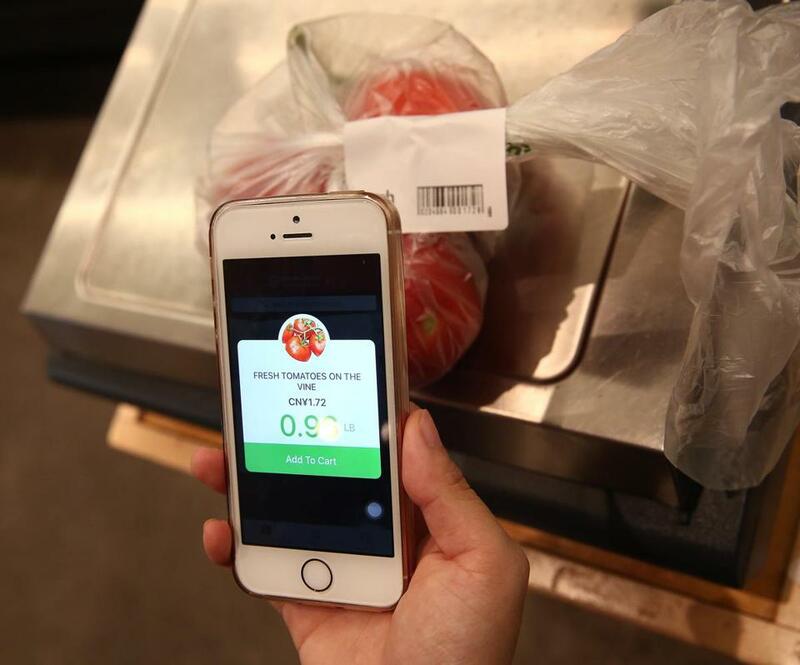 Mandy Xu weighed the tomatoes on a digital scale and then scanned the printed label. According to a soon-to-be published survey conducted by Phononic, a global provider of refrigeration and freezing technology, 90 percent of people surveyed said they wanted to shop in a grocery store that understands how to make buying groceries easier and more efficient. And half of the survey respondents said that grocery stores haven’t figured out how to use technology like other retailers have. For the past few decades, grocers have largely focused on updating the selections on their shelves: offering more organic produce or expanding their international food options, for example. But on the technology side, supermarkets have fallen victim to an increasingly wide “innovation gap,” said Sterling Hawkins, who oversees operations and venture relations at the Center for Advancing Retail & Technology, a consultants group that connects retail clients to companies that offer innovative solutions to longstanding problems in the industry. In the ensuing months, many grocers took steps to introduce more technology in their aisles. The stock price for Kroger Co., the country’s largest supermarket chain, took a dive after the Whole Foods acquisition was announced, and the grocer responded by announcing the national expansion of its “Scan, Bag, Go” program, which gives customers hand-held scanners to tally their items as they shop, then check out without interacting with a cashier. Kroger also plans to install more digital shelves, which display video ads and offer coupons to customers. The company says that, eventually, the displays will sync with shoppers’ phones, highlighting items on a grocery list, for example, or offering discounts to loyal shoppers. “While research has shown that the majority of shoppers still prefer buying groceries in person instead of online, those same shoppers are increasingly expecting an experience that blends online with offline,” said Karen Garrette, global retail industry director at Microsoft, who is working on Kroger’s in-store technology. Other grocers have turned to acquisitions as a way to access technological savvy. Walmart acquired an Amazon competitor, Jet.com, in 2016 to get a stronger toehold in e-commerce and has been intent on finding ways to sync its online and in-store sales. It recently acquired the delivery service Parcel for day-of purchases made online and is seeking a patent for an app that can help shoppers see images of fresh produce before it is purchased for delivery. Target recently acquired the same-day delivery service Shipt, the Alberston’s chain recently bought the meal-kit service Plated, and Kroger is rumored to be in talks about acquiring Boxed.com, an online competitor to Costco. And some have turned to partnerships. 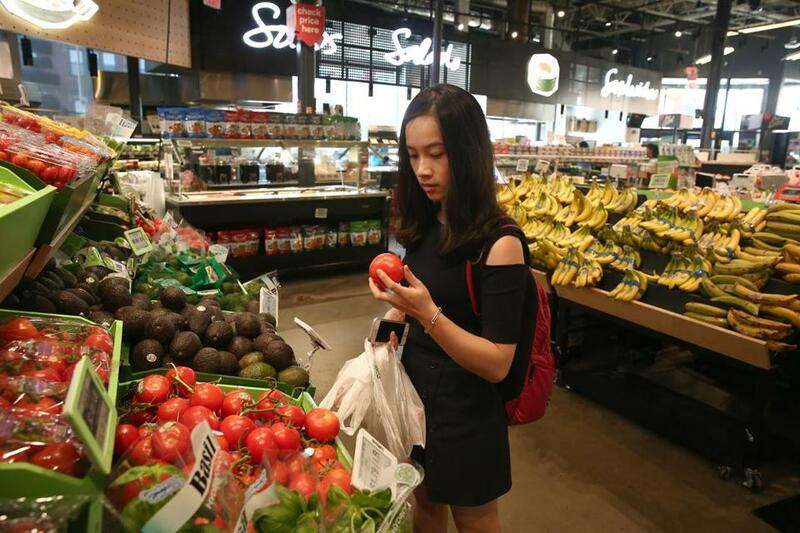 The bfresh supermarkets in Allston and Somerville had experimented with an app called Selfycart that allowed shoppers to scan items then have a store employee scan a code on their phone on the way out. Stop & Shop has partnered with a company called HowGood to allow shoppers to scan items to learn more about the ethical standards of each product. And Roche Bros. and Market Basket now partner with a local startup called The Dinner Daily, a service that uses the sales offered in weekly supermarket circulars to create inexpensive meal plans for shoppers. The challenge for grocers is finding ways to both speed up and slow down the shopping, said Leon Nicholas, an analyst at Kantar Retail. Some are zeroing in on the fact that shoppers are buying more fresh food than ever and are choosing to focus on finding ways to get shoppers in and out of stores faster to get that fresh food on a regular basis. The hope is that customers making multiple trips each week will eventually spend more. At the same time, some stores are looking for ways to get shoppers to linger, in hopes they, too, will spend more money, Nicholas said. He pointed to the rise of in-store cooking demonstrations and full-service “grocerants,” such as the Burger Bar at Wegmans in Medford and the Borgatti Bar that will soon open in the Whole Foods in Shrewsbury. Now, even the most established grocers must begin to think like startups.